The African Porcupine, Hystrix Africaeaustralis, is a common animal in Kruger Park. It is strictly nocturnal and spends the day hidden in holes in termite mounds. The porcupine is a rodent and is exclusively vegetarian. Its diet includes roots, bulbs, wild fruits, seeds and the bark of some trees. It is unmistakeable with its black and white quills. The quills cannot be “shot” but are fairly loosely attached to the body and thus are used as a protection against lions, hyenas and leopards. In my experience the leopard is the most successful predator in killing porcupines as a result of its agility – it is able to jump right over the quills and attack the porcupine head-on. From time to time we see a predator with porcupine quills embedded in its mouth or body. This happens because the quills are easily dislodged from the porcupine’s body. 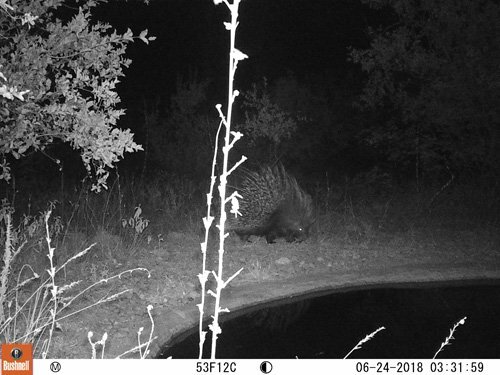 Porcupine at the waterhole at Marula Boma. When disturbed the porcupine is quite comic : it rattles its quills, stomps its feet and makes a strange grunting sound. Guests of Viva Safaris sometimes see porcupines at Marula Boma during the Bush BBQ. This month we have seen plenty elephants as well as lions. Wildebeest and Zebra are seen regularly on the airstrip. Hippo are seen regularly in the Olifants River. On one of the bushwalks we saw the resident Black Rhino bull (Zulu) 40 metres away from us – he charged at us twice and he moved away afterwards. During one Sunset Drive we spotted two female lionesses on the Olifants road near Tremisana Lodge and 3 big male lions on the Olifants road near Nonwana and 1 big bull elephant at Marula Boma. On the way back we got a breeding herd of elephants. On a Sleep out safari a Bull elephant charged me at Marula Boma. Luckily he was just playing around – I accept his dominance ! As the temperatures rise so we are seeing more crocodiles in the Olifants River. A herd of buffalo some nights sleeps at Marula Boma. We have had a very busy month and guest numbers are picking up. The sightings are really good as it’s a bit easier to find the animals in the bush now that it is not so thick. I have been very lucky in Kruger to find the Big Five more than once on a particular day. 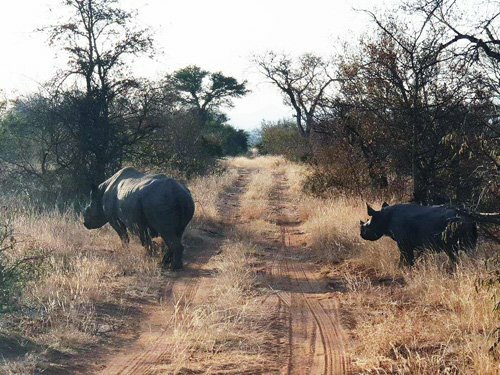 The drives on Balule have been just as great and it is one of best places to find Black Rhino. Now with great clear night skies we can’t have a better place to have dinner as at the Marula Boma on the first night you arrive. The lack of clouds has also helped our guests to get great shots of the Blyde River Canyon on their return journey. 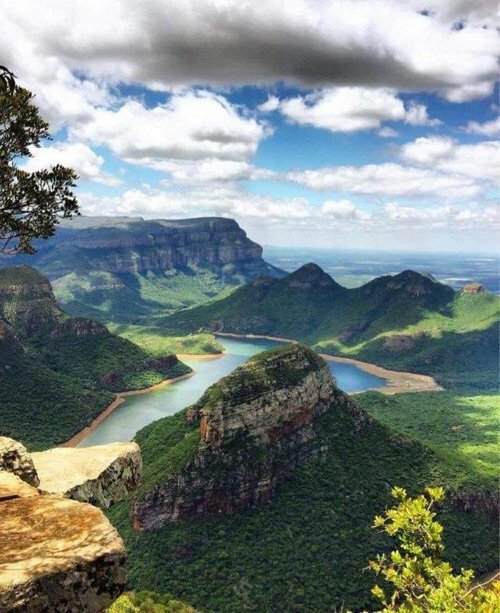 Clear view of Blyde River at Three Rondawels lookout. It’s happening again at Tremisana lodge. On one Sunset Drive we saw lions – although it’s been very quiet, the bush will always surprise you. My guests were excited about the lions and then the moment we reached Marula Boma we saw two hyenas and a honey badger. On my Sundowner Drives we are getting sightings of two black rhinos. Is that a rock or is it a termite mound? No! It is a Rhino! This month has been an absolute thrill to see our Black Rhinos roaming around as well as the odd White Rhino here and there. 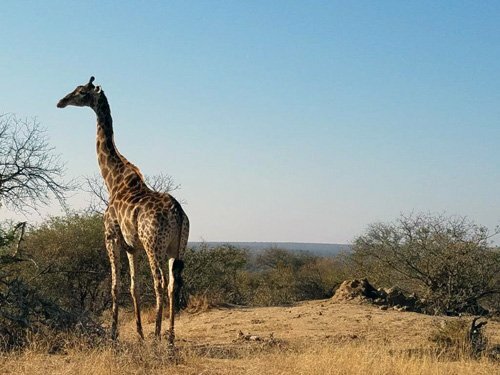 On our morning drives we experienced the lovely crisp air while seeing breath-taking sunrises but sightings were a bit quiet : we managed to find Giraffe and Zebra at times and one fortunate morning we were surprised with a beautiful Black Rhino Bull making his way across the road. I was extremely happy to be able to show my guests the rhino as it was the only one of the Big 5 they were missing on their safari. Everybody needs a little exercise and a good stretch after a long trip in the vehicle. 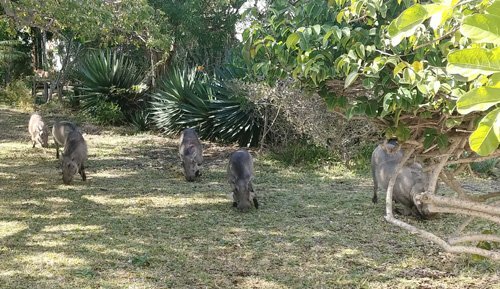 We conduct our walks next to the Olifants River and there we get to view the different residents in the river such as the Hippos and occasional crocodile as they are quite dormant in our winter season. Getting to know the area a little better and becoming more in touch with nature in a more intimate way is what the bush walk provides for our guests and I enjoy every moment I get to give them that opportunity. On one occasion while making our way to where we start our walks we came across a massive breeding herd of Elephants and Elias as the driver and myself on the tracker seat could not ask for anything better than being surrounded by these majestic giants – a day I was hoping for, for quite some time, eventually happened and I was able to get up close and personal with these animals slowly passing in front of me. An experience never to be forgotten. Black Rhino bull, female with a calf joined by another female and her calf feeding on the foliage in the spruit area. Black Rhino female and calf giving us a close inspection as she made her way closer to my vehicle, Black Rhino bull lazily moving next to the road. Black Rhino female and calf feeding in the spruit and about 500 metres away we also came across a White Rhino Bull; all this throughout this month has been nothing but a blessing from Mother Nature to us and I am grateful to be able to see these animals in their natural habitat. How lucky we are to still see these beauties ! Leopard! Right before we got back to Tremisana Lodge from a Sundowner Drive we spotted a big Male Leopard lying under a tree relaxing and doing what cats do best. We also came across elephants, rhino and lion with cubs. It is one of my favourite drives to do as it gives me the opportunity to be in the Bush for a long period of time and to cover more area as would be able on a shorter drive. The time spent with my guests also allows me to get into detail about the finer things in nature as well as give them the opportunity to enjoy nature for its animals and every other aspect that it provides. I was fortunate to find buffalo at the area where we have our dinner at Marula Boma as well as to see Lions on the Barnards property. We have also had Elephants and other general game – all in all making the start of the safari a good memory and experience for my guests. I really enjoy my career – being able to create an unforgettable experience for my guests as well as creating awareness of Nature as a whole is a privilege I am glad to have. So the day started off very cloudy in the morning on the way to Kruger after a really good breakfast at Marcs Camp. Arriving at Kruger, I do a briefing with my guests about How, When, Where and How the day is going to run + a few safety regulations for the day. 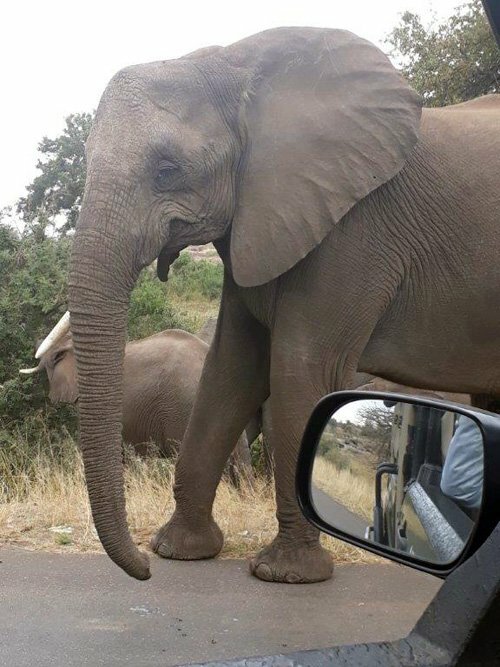 As we enter the Orpen Boom gate we get a big African Elephant Bull viewing a good 20 min as he was up close to the open vehicle. On the H7 we saw a lot of general game including Giraffes, Zebra and Kudu. On the S106 towards Satara we get a lot of general game. We finally get buffalo (Dagga Boys) at Rabelais loop. After Bobbejaanskrans look-out we found a lot of general game. We found White headed Vulture and Southern Ground Hornbill at Nsemani Dam with a pod of Hippos including Babies as well:).On the other side of the dam there was a small breeding herd off Elephants. We then had a sighting of a lioness on a young gnu kill. Across the road Hyenas were waiting for the lioness to finish. What we didn’t know was 2 km ahead there were two Cheetahs ! After lunch, we got more Buffalo at Welverdiend waterhole and at Muzandzeni picnic area I spotted male and female Ostrich. 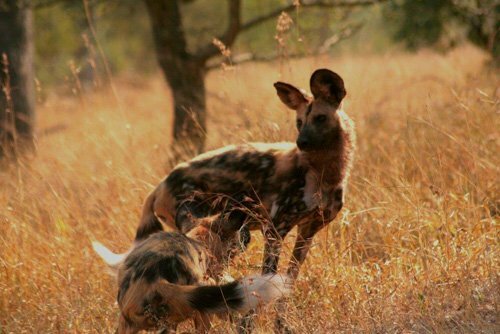 Further on we had a brilliant sighting of Wild Dogs. On the way out, we had a good White Rhino sighting. 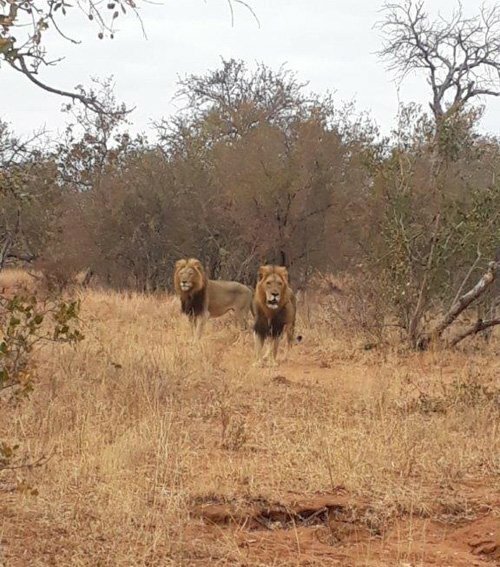 2nd : Kruger – the day was very cold and windy – sightings difficult but lions Xibotwana on s100, buffalos Nsemani Dam, elephants Sweni road and general games Orpen road. 9th : Elephants h7 road, buffalo Nsemani dam, lions Sweni bridge and general game s100. 20th : 4 White Rhino, elephants Timbavati riverbed, lions h6 road, 6 cheetah s40. 24th : 2 white rhinos before reception, elephants Timbavati riverbed and buffalos Nsemani dam, pride of lions at Nyamarhi Waterhole after Ngotso, leopard with 2 cubs at Ngotso North. 2nd : On BALULE we found the pride of lions together the cubs at Barnards north of Ngwenya dam – 7 cubs and 4 females hunting. 3 black rhinoceros together with a big herd of elephant with young. On Olifants road we found a leopard walking on the road. Just before Marula Boma we found 4 big buffaloes – so we saw the Big Five in two and a half hours – must be some kind of record !!! 6th : KRUGER Near Nwanedzi bridge we found 3 lionesses on a zebra kill in the river bed. At H1-3 near Tshokwane we found a leopard with an impala. 9th : BALULE we found a big breeding herd of elephants on Sable road. One of them came close to us – less than 2m. 20th : KRUGER on H7 we found 4 lionesses trying to catch a zebra – one of them was using our vehicles to get close to them but the impala saw them and alarm called and the zebra ran off. At Nsemane dam we found a herd of buffaloes lying next to the road. 23rd: KRUGER at Nyamarhi water hole we found a pride of 13 lions lying down. 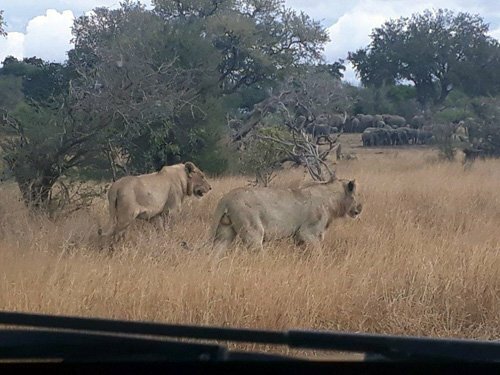 A warthog appeared and all the lions tried to catch him but were unsuccessful – young pride members messed up. With the shortage of grass, the warthogs are coming right into the camp and thrilling our guests. We had elephants eating the bougainvilleas outside the front entrance. Tremisana Dam is attracting large numbers of animals, especially impalas. Fiamma Sandri is studying Food Economics at Parma University in Italy. We know her through our Catholic Volunteer Africa program as her uncle is Bishop Joe Sandri of Witbank. Fiamma will be very helpful in August when we usually have numerous Italian guests, some of whom have limited knowledge of English. She has successfully impressed me with her cooking skills – she makes an Amatriciana sauce to die for ! Henco Rheeder is doing his final practical component with us. He has studied at the International Hotel School in my home town, Durban. Henco has been deployed in the Office but has applied for his PDP ( professional driving permit ). Henco, like Fiamma, is quite a cook – he made a bread pudding that rates among the very best I have ever tasted ! Our cooking staff are taking notes ! The buffalo herd is moving through the camp on a regular basis in search of food. Hyenas and lions are heard every night. We have erected a new 4 – person tent. There has been an increase in tourist numbers this month. We are seeing the wildebeest, nyala, impala and kudu more frequently – they seem to be a lot less skittish. We have had numerous requests over the 20 years that we have run Marc’s to include some free time for the guests to enjoy the pristine nature of this unique lodge. In fact, some guests doing the longer safaris (5 or 6 days) have forfeited one or other activity so as to relax and have some leisure time at their treehouses/ tents or around the pool. For such guests, as of 1 August 2018, we have decided to replace the afternoon Tshukudu drive with afternoon at leisure and Sunset Drive on Motlala. So from now on, guests on the 5 or 6 day Lodge/Treehouse and Lodge/Tent safari packages will be joining the guests from Katekani on this superb Sunset Drive. We have had excellent sightings of both Black and White Rhino as well as Leopard on Motlala. The resident buffalo herd is seen each and every drive ! Thanks for your support – the 2018 July figures were better than anticipated ! Excellent stay, unique and exciting adventure. The lodge was great and the walking and driving tours excellent. The day in Kruger was the highlight. Staff was friendly and accommodating. Anybody thinking of also doing the treehouse needs to know it is in a great location but too cold in the wintertime. Rustic camp with tree houses and tents. Deep in the Bush is this very friendly camp. Wonderful staff who care for your needs. My room/tent was quite a distance from the main reception which can be stressful when you’re keeping an eye on Leopard, Hyena and the likes but Ivy the wonder manager/coordinator of the camp made sure I was safe as she walked me home nightly. The sounds of the African night are evident nightly as the Baboons are barking along with the hyenas laughing and the deep call of the Lion seem to get closer each night. There were two Leopards around camp nightly, I heard them but didn’t encounter them on my walks back and forth. Fabulous food, service, informative staff and a beautiful area to explore. Thank you to you all at Marc’s treehouse camp for a fantastic experience. I just did a 4 Day Lodge and Treehouse Safari with Viva Safaris in mid July 2018. It was absolutely FANTASTIC! From my arrival at Tremisana Lodge to my stay at my very own Treehouse Viva Safaris took care of all my needs and then some. And the SAFARIS and Bushwalks?! They were AMAZING – though I didn’t see the “Big Five,” (more like, the “Big Three” – the Leopards and Buffalo were very elusive) it was still absolutely enjoyable, and I came away with new friends, great videos and an incredible experience that will make me want to return! This was my 7th time visiting Africa and I can’t say enough positive things about my experience with Viva Safaris- from the very beginning of speaking to Patti while booking the trip, to saying goodbye to all the wonderful staff and guides- I was truly impressed with how my entire trip worked out! I actually stayed at the Tremisana Lodge for 11 Days because I knew the 6 days wouldn’t be enough. The food served were excellent family style meals- I usually get sick while I travel but had no problems. My room was lovely, and staff cleaned it daily. All my guides were excellent, and I hope to keep in touch with them! I would absolutely return and do another trip with Viva Safaris! Marcs Treehouse Lodge, Tremisana Lodge and Katekani Tented Lodge on TripAdvisor.